We have a large collection of blueberry recipes to make it easy to enjoy the health benefits of this tasty little berry. Blueberries - delicious and healthy! They are naturally high in antioxidants for disease protection, they help to improve memory, and are heart healthy. They have been called "the power food". Find your favorite recipe from our vast collection! 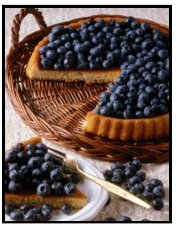 Search for blueberry muffin recipes, blueberry pie recipes, blueberry jam recipes and a large variety of blueberry dessert recipes. We are always looking for new recipes and adding them to our collection. If you wish, you can help by submitting your favorite recipe. Just click on "submit recipe" and we will add it to our recipe collection for everyone to enjoy! To browse our blueberry collection, just click on a button on the left or use the handy index below. Enjoy your quest to find the most delicious blueberry recipes! Try the best blueberry muffin recipe and many more blueberry recipes! Delicious Blueberry Cobbler Recipes -Free! Are you looking for a very special blueberry desert? Try our delectable Blueberry Cobbler recipe! We have some of the most delicious blueberry cheesecake recipes. Many varieties - No duplications. Large variety of blueberry coffee cake recipes. Try them all! There are many different ways to make a blueberry pancake. Choose your favorite recipe! Any of these Blueberry Cake Recipes are sure to be winners at your next get together with family and friends! Check out our collection of delightful blueberry cookie recipes including blueberry biscotti. Yummy Blueberry Jam Recipe - Free Recipes! Top any pancake, waffel, or desert with one of these delicious Blueberry Syrup Recipes and you will instantly make it more decadent and get your antioxidants. My Favorite Blueberry Pie Recipes - Try them all! Surprise your friends or family with a warm delicious blueberry pie fresh from your oven. Find your favorite Blueberry Scone and Biscotti Recipes. We even have Blueberry White Chocolate Scone and Biscotti Recipe. Blueberry Smoothie and Drink Recipes - Try one today! Delicious and healthy - Blueberry Smoothie Recipe - Three berry smoothie and other delicious blueberry beverages. Kids Blueberry Recipes - Blueberries are great snacks for kids because they’re packed with powerful nutrients. Do you have a favorite blueberry recipe you would like to share? Submit your recipe here. Useful information about growing blueberry plants. Your best blueberry resource! Contact us. Our blueberry enthusiasts would love to hear from you! Enjoy the amazing health benefits of blueberries! blueberries rank #1 in antioxidant activity when compared to 40 other fresh fruits and vegetables.